The first of the series of acts by which the South was deprived of its due share of the territories, originated with the confederacy which preceded the existence of this Government. It is to be found in the provision of the ordinance of 1787. Its effect was to exclude the South entirely from that vast and fertile region which lies between the Ohio and the Mississippi rivers, now embracing five States and one territory. The next of the series is the Missouri compromise, which excluded the South from that large portion of Louisiana which lies north of 36″ 30′, excepting what is included in the State of Missouri. The last of the series excluded the South from the whole of the Oregon Territory. All these, in the slang of the day, were what are called slave territories, and not free soil; that is, territories belonging to slaveholding powers and open to the emigration of masters with their slaves. By these several acts, the South was excluded from 1,238,025 square miles – an extent of country considerably exceeding the entire valley of the Mississippi. To sum up the whole, the United States, since they declared their independence, have acquired 2,373,046 square miles of territory, from which the North will have excluded the South, if she should succeed in monopolizing the newly acquired territories, about three-fourths of the whole, leaving to the South but about one-fourth. Forming only one-fourth of the states would put the South in dire straits indeed, as the others might pass a constitutional amendment to abolish slavery. One can’t argue with the facts. Congress did exclude slavery from the Northwest Territory (the five states and one territory Calhoun mentions) and from the Louisiana purchase north of 36″ 30′, except Missouri itself. But Southerners could still go to those lands, settle, and bring with them anything they liked except for slaves. (Slaves could go too but they might become free if they did. So even Southerners who didn’t count to Calhoun and his class could move freely. Of course that only adds a grievance for the South.) When Calhoun says that the North monopolized the territories, he means the North excluded slavery from them. Not a sliver of daylight separates slavery from the South, despite Calhoun’s earlier, transparent claim that the sectional disequilibrium formed an issue apart from slavery. Calhoun insisted that had the North not barred the South from so much territory, it would have gained population at a similar rate, which would have translated directly into House seats and thus yielded a sectionally balanced House as existed in the 1790s. Immigrants ultimately wanted land, after all. Here the South Carolina conservative repudiates literally almost the entire history of slavery under the Constitution, plus some of its time under the Articles of Confederation. Slavery settlements do not get much more ancient in American history than Thomas Jefferson’s Northwest Ordinance. Calhoun apparently did not consider that most immigrants, even in the early nineteenth century, would come off the boat as unskilled labor and need to find jobs to earn enough money to go west and buy land. Prosperous, highly skilled people in the mother country rarely have cause to immigrate in great numbers, after all. The South had plenty of unskilled labor in the bodies of its slaves. Many also performed skilled labor. Thus the very institution Calhoun built his worldview around preserving helped create the existential threat to it that he rose to denounce. When I said “tomorrow” in Friday’s post, I meant “Monday”. Sorry about that. Let’s call this a special Sunday post to split the difference. When last we left the ailing Calhoun, he informed the Senate that the sectional balance he insisted ratification of the Constitution depended upon already stood on thin ice with barely-enslaved Delaware no longer properly loyal to slavery. Thus the slave states numbered twelve and twenty-four senators to the free states’ thirteen and twenty-six, with Delaware as a neutral party. A free California just amounted to pounding that ice with a sledgehammer. According to the apportionment under the census of 1840, there were two hundred and twenty-three members of the House of Representatives, of which the Northern States had one hundred and thirty-five, and the Southern States (considering Delaware as neutral) eighty-seven, making a difference in favor of the former in the House of Representatives of forty-eight. The difference in the Senate of two members, added to this, gives to the North, in the electoral college, a majority of fifty. Since the census of 1840, four States have been added to the Union — Iowa, Wisconsin, Florida, and Texas. They leave the difference in the Senate as it stood when the census was taken; but add two to the side of the North in the House, making the present majority in the House in its favor fifty, and in the electoral college fifty-two. The result of the whole is to give the Northern section a predominance in every department of the Government, and thereby concentrate in it the two elements which constitute the Federal Government, — majority of States, and a majority of their population, estimated in federal numbers. Whatever section concentrates the two in itself possesses the control of the entire Government. The North outnumbered the South. It had control in the House, in the Electoral College, and threatened to solidify its control in the Senate. Remaining in the Union left the South at the North’s. In a sense, the North’s numbers besieged the South. Calhoun had a lot of experience at being outnumbered. His native South Carolina had a slave majority of 51.53% according to the 1820 census, thirty years before Calhoun gave his final speech. Its lowcountry black belts counties could reach 85% slave, higher when the planters retired to Charleston for the season. Even ten years later, the Deep South averaged only 47.28% slave and only Mississippi had joined South Carolina in the majority-slave club. the population of the United States, including Vermont, Kentucky, and Tennessee, which then were in their incipient condition of becoming States; but were not actually admitted, amounted to 3,929,827. Of this number the Northern States had 1,997,899, and the Southern 1,952,072, making a difference of only 45,827 in favor of the former States. The number of States, including Vermont, Kentucky, and Tennessee, were sixteen; of which eight, including Vermont, belonged to the Northern section, and eight, including Kentucky and Tennessee, to the Southern, — making an equal division of the States between the two sections under the first census. According to the last census  the aggregate population of the United States amounted to 17,063,357, of which the Northern section contained 9,728,920, and the Southern 7,334,437, making a difference in round numbers, of 2,400,000. The number of States had increased from sixteen to twenty-six, making an addition of ten States. In the meantime the position of Delaware had become doubtful as to which section she properly belonged. Considering her as neutral, the Northern States will have thirteen and the Southern States twelve, making a difference in the Senate of two Senators in favor of the former. Calhoun tips his hand here by citing barely-enslaved Delaware as an uncertain neutral. Despite his opening insistence that a vague sectional imbalance, not slavery, formed the cornerstone of sectional discontent he goes on to list the least enslaved slave state as the one which at least partly left the South for the North. The line between the two remained the line between slavery and free soil. According to Calhoun, the sections agreed to the Constitution with the understanding that they came into the Union as equals. In other words, the Union required precise equality of North and South. One supposes the framers had a few too many the night before they planned to write those clauses. I plan a future post to highlight some other issues with Calhoun’s position here. Regardless, that old order faced the crisis of 1850 like Calhoun did, in its twilight years. The South could no longer count Delaware as anything better than a sectional neutral, Calhoun wrote. To him, California’s admission did not break the senatorial balance. Delaware’s disloyalty to the South did that, or at least badly damaged it. He might have added examples from other Border States, the Upper South, and even the occasional Deep South politicians breaking faith with the solid South he invented as a new constitutional unit over the states and, in some ways, the national government itself. And the Senate held the last vestiges of Calhoun’s Ancien Regime. Tomorrow, the Senator from South Carolina has some remarks for the House. 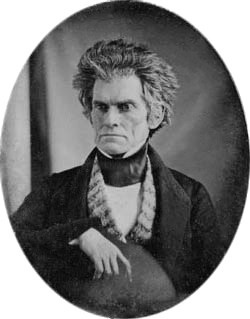 A vice-president for two presidents, a secretary of state, and most famously a senator, South Carolina’s John C. Calhoun spent decades as the Senate’s leading prophet of disunion. In his way a statesman-philosopher for slavery, Calhoun built a whole worldview around the notion of it as a positive good. His speeches very nearly write the history of Southern discontent and much of the usual narrative draws heavily from them. This of course skews our understanding of the antebellum South in a particularly South Carolinian direction. Calhoun’s vision of a united South, of a South at all, obscures the very divisions he spent some of his more famous speeches denouncing. As with Henry Clay, the crisis of 1850 came upon Calhoun in the twilight of his life. Sixty-seven and sick, he heard Clay’s measures and prepared a reply that age and infirmity left him unable to deliver. In fact, Calhoun could not physically walk into the Senate chamber. On March 4, 1850, one of Calhoun’s fellow South Carolina luminaries from the 1830s Nullification Crisis carried him in. Wrapped in flannels, hair soaked with sweat, emaciated, Calhoun gripped the chair and sat silent. His speech passed to his South Carolina colleague, who pleaded poor eyesight and passed it to Virginia’s James Mason. The author of the new Fugitive Slave Act dutifully rose to read Calhoun’s words. Unlike the Southern Address, Calhoun made the whole nation his audience but like the Southern Address he spoke for the South, even if the South he spoke for lived mostly in his mind. In the dark nights of 1850, Calhoun wrote, the South no longer felt its people (the white ones, anyway) or honor (again, of the white South) safe in the Union. Why? One of the causes is, undoubtedly, to be traced to the long-continued agitation of the slave question on the part of the North, and the many aggressions which they have made on the rights of the South during the time. I will not enumerate them at present, as it will be done hereafter in its proper place. There is another lying back of it — with which this is intimately connected — that may be regarded as the great and primary cause. This is to be found in the fact that the equilibrium between the two sections, in the Government as it stood when the constitution was ratified and the Government put in action, has been destroyed. At that time there was nearly a perfect equilibrium between the two, which afforded ample means to each to protect itself against the aggression of the other; but, as it now stands, one section has the exclusive power of controlling the Government, which leaves the other without any adequate means of protecting itself against its encroachment and oppression. Calhoun went on at length. More of his farewell speech tomorrow. Back when I wrote about the election of 1848, I referred to Zachary Taylor as a blank slate. He promised not to veto anything Congress sent him about slavery in the territories. Southerners read into that Old Rough and Ready’s opposition to the Wilmot Proviso. Northerners read into it the opposite. I left hanging then the question of which section read correctly. His plantation and hundreds of slaves aside, Taylor spent forty years of his life in the army. 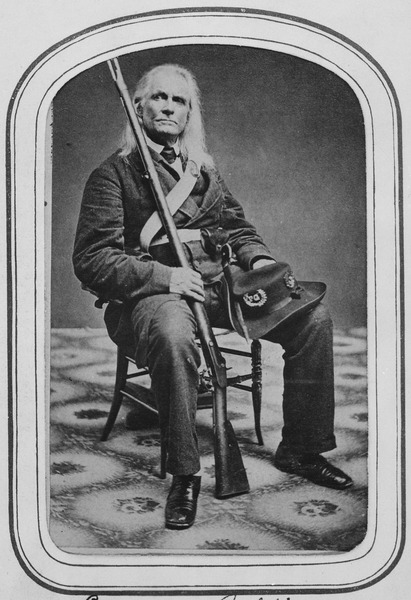 He served in the War of 1812 and in Indian wars before becoming a national hero in the Mexican War. For him the military provided a cure to Southern insularity. Taylor’s service took him north to Minnesota and Wisconsin as well as south into Mexico. He regarded himself something closer to an American first and a Southern planter second. By the time he took office, Taylor befriended and took advice from no less an antislavery politician than New York’s Whig senator, William Seward. The House convened and no candidate could command a majority for the Speakership. Democrats put forward Howell Cobb of Georgia. Several Democrats refused to support him. The Whigs nominated Robert Winthrop, Cotton Whig and Speaker of the previous House. Conscience Whigs turned Free Soilers refused to support Winthrop despite his approval of the Wilmot Proviso. Six southern Whigs, led by Alexander Stephens and Robert Toombs (of Cobb’s native Georgia) declined to support Winthrop on identical grounds but for the opposite reason: Once upon a time Winthrop had supported the hated Proviso. Three weeks and sixty-two ballots produced no Speaker but did produce many threats of disunion and fistfights between Northern and Southern Congressmen. The more dignified, deliberative Senate joined in. Jefferson Davis challenged an opponent to a duel. His fellow Mississippian Henry Foote drew a loaded revolver during debate. (Talk about uncivil and polarized politics!) The House finally adopted a special rule to elect a Speaker with a plurality instead of a majority and Howell Cobb assumed his place on the sixty-third ballot, but more rancorous debate remained ahead. The Congress that elected Cobb Speaker had nearly a month left before Henry Clay rose to present his resolutions. The Deliberately Vague Northern Hemisphere Winter Holiday is upon us. As a result, I’ve chosen to take the day off. Not to spend with my family, mind. I have video games full of people made of pixels who desperately need murdering and television that needs watching so bad it cries itself to sleep every night. That’s what well-adjusted adults do on their Deliberately Vague Northern Hemisphere Winter Holiday. Everyone knows that. Don’t give me that look. Go enjoy your Deliberately Vague Northern Hemisphere Winter Holiday. The Southern congressional delegation did not unite behind Calhoun’s words as he hoped. But Calhoun could go over the heads of his fellow politicians. His Southern Address achieved considerable popularity in the South and an all-South convention might form the united front he wanted, either to stop the Wilmot Proviso or to take the South out of the Union. South Carolina radicals (which, to those outside the state, included Calhoun) had good reason to look askance at their fellow Southerners. In the past Carolina got out ahead of the South and expected it to follow only to find other slave states unmoved. Likewise the rest of the South had good reason to look askance at South Carolinian radicalism, as the Palmetto State’s political spectrum often ran only between when secession should happen instead of if it ought to. The call for a Southern convention could not, then, come from South Carolina. Fortunately for Calhoun’s hopes, the club of slave states where slaves outnumbered free people had another member in late 1849: Mississippi. It called the Mississippi Slaveholders Convention, with the understanding that its South Carolinian instigators would lay low. The Mississippi legislature appropriated $20,000 ($532,618.77 in 2011 dollars) and $200,000 ($5,326,187.75 in 2011 dollars) for the defense of the state should the Wilmot Proviso become law. To Nashville came not a single Border State delegate. Louisiana’s moderate legislature refused to send delegates, as did North Carolina’s. Florida nearly joined them in abstaining. Texas sent only Sam Houston, always a moderate on slavery. Alabama sent delegates, but instructed them not to consider disunion. When called to elect delegates, ninety-five percent of Georgia voters stayed home. South Carolina alone supplied a full delegation that included many influential state politicians, but they maintained their low profile from the Mississippi Convention. Deep South moderates dominated Nashville, denouncing Clay’s measures (introduced between the Mississippi and Nashville conventions), the Wilmot Proviso, and endorsing the plan to extend the Missouri Compromise line once more. They adjourned on June 12, taking a wait and see approach to the debates in Washington. This post properly belongs in the reaction to the Wilmot Proviso, but I passed it over due to aforementioned confusion. Facing the chaos during the lame duck session of Congress in 1849, a group of Southern congressmen called on John C. Calhoun to draft the South’s response. History calls it his Southern Address, reflecting that Calhoun directed his remarks to the South and called for unity against the North in an all-South political movement. We, whose names are hereunto annexed, address you in discharge of what we believe to be a solemn duty, on the most important subject ever presented for your consideration. We allude to the conflict between the two great sections of the Union, growing out of a difference of feeling and opinion in reference to the relation existing between the two races, the European and the African, which inhabit the southern section, and the acts of aggression and encroachment to which it has led. Northern agitation against slavery provoked the South. He gave his audience a list of those provocations: The Northwest Ordinance’s prohibition of slavery, the same across much of the Louisiana Purchase in the Missouri Compromise, personal liberty laws that interfered with the capture of fugitive slaves, and the organization of Oregon as a free territory. Abolitionists of the North, openly avowing their intention, and resorting to the most efficient means for the purpose, have been attempting to bring about a state of things to force the Southern States to emancipate their slaves, without any act on the part of any Northern State to arrest or suppress the means by which they propose to accomplish it. In other words: Northern states arrest abolitionists for the crime of opposing slavery and suppress their petitions, newspapers, and societies for the same reason. The South had long done so, but the North must follow. Preserving slavery required not just legal restrictions on blacks, but also upon whites in North and South alike. constitutes an essential part of the constitutional compact, and of course the supreme law of the land. As such it is binding on all, the Federal and State Governments, the States and the individuals composing them. The sacred obligation of compact, and the solemn injunction of the supreme law, which legislators and judges, both Federal and State, are bound by oath to support, all unite to enforce its fulfilment, according to its plain meeting and true intent. Nullification to an antislavery tariff in the 1830s, but never to antislavery state laws in 1849. In citing states’ rights, many stop there. The states have rights, period. But rights to what? When it comes to discussing the South and its motives leading into the Civil War, its partisans rarely find occasion to specify. Calhoun and his contemporaries had no such inhibitions. He makes that very clear, as do many others, in both their consistent patterns of behavior and in private and public proclamations. must prove by your acts that you hold all other questions subordinate to it. If you become united, and prove yourselves in earnest, the North will be brought to a pause, and to a calculation of consequences; and that may lead to a change of measures, and the adoption of a course of policy that may quietly and peaceably terminate this long conflict between the two sections. If it should not, nothing would remain for you but to stand up immovably in defence of rights, involving your all–your property, prosperity, equality, liberty, and safety. Southern unity for slavery, in the Union if possible but out of it if necessary. When Henry Clay stood to present his last compromise, he stood to answer Calhoun’s threat. Though Ona freed herself and escaped to New Hampshire, she still had to live as a fugitive. Wanting his property back, Washington had an advertisement posted notifying Philadelphia of her escape and offering a reward. Men in Washington’s employ, or just interested in the reward, could find her and take her back at any time if they learned where she went. A senator’s daughter recognized Ona from Philadelphia and word soon reached Washington. He wrote to Portsmouth’s customs collector about capturing Judge and returning her. The collector, a political appointee of Washington’s by the name of Joseph Whipple, refused to seize Ona on the grounds that doing so might cause a riot. He did, however, pretend he wanted to hire her and so gained an interview with Judge. It gave me much satisfaction to find that when uninfluenced by fear she expressed great affection & reverence for her Master & Mistress, and without hesitation declared her willingness to return & to serve with fidelity during the lives of the President &his Lady if she could be freed on their decease, should she outlive them; but that she should rather suffer death than return to Slavery & [be] liable to be sold or given to any other persons. I regret that the attempt you made to restore the Girl (Oney Judge as she called herself while with us, and who, without the least provocation absconded from her Mistress) should have been attended with so little Success. To enter into such a compromise with her, as she suggested to you, is totally inadmissable, for reasons that must strike at first view: for however well disposed I might be to a gradual abolition, or even to an entire emancipation of that description of People (if the latter was in itself practicable at this moment) it would neither be politic or just to reward unfaithfulness with a premature preference; and thereby discontent before hand the minds of all her fellow-servants who by their steady attachments are far more deserving than herself of favor. After leaving office, Washington dispatched a nephew to resolve matters. Ona met with Washington’s nephew and he tried to persuade her to return. A married woman with an infant child now and her husband away at sea, Judge refused. Washington’s nephew left her but confided in a senator that he would soon seize Judge and carry her away. The senator sent word to Ona and she ran a second time, hiding with a free black who lived some distance from town. After his nephew’s second attempt, Washington let the matter drop. Judge lived until 1848. By Virginia law, she and her children (and also any children her daughters, granddaughters, etc ever had) never ceased being slaves. Washington could have tried again and succeeded in taking her and her children. So could the Custis heirs, who would include Robert E. Lee’s wife and children. After Washington died Ona might have felt safe, and certainly personal liberty laws shielded her in the 1840s when two abolitionist newspapers printed her story, but the possibility never quite went away. Even if unlikely, a Custis heir could present himself and, after 1846, use the very articles detailing her life as evidence he owned her. The new Fugitive Slave Act stripped away that security. Slave catchers became a real threat even in the most abolitionist parts of the North. According to David Blight, something on the order of twenty thousand people fled from the North into Canada in response to the new law. It took away the security that personal liberty laws and local abolitionists gave to people like Ona Judge. While technically always runaways, the once distant threat of them and their children being taken back to slavery became at a stroke a clear and present danger. Ona Judge lived roughly fifty years as a fugitive slave, one of the many that made Southerners so irate and spurred their demands for the new Fugitive Slave Act. Her life also helps illustrate how much security, or how little, a fugitive that remained in America might hope for. I regret to begin writing about a slave by talking about the slave’s owners, but I think that part of the story adds meaningful context. Daniel Parke Custis owned 285 slaves and almost 18,000 acres of land in Virginia. He married a woman decades his junior, the eighteen year old Martha Dandridge and they lived together at White House Plantation. In 1757, after seven years of marriage, Custis died without leaving a will. Under Virginia law, Martha received one-third of the estate for her own use and income during her lifetime. The other two-thirds formed a trust for her surviving children with Custis, only one of whom reached majority. The widow Custis married a second time, to a wealthy planter named George Washington. On marriage, Washington became manager of the Custis estate and Martha’s dower share, including around eighty-five slaves. One of those slaves, Betty, had a child with one of Washington’s white indentured servants around 1773. We don’t know the exact year. That child, Ona (or sometimes Oney), inherited her mother’s enslavement per the Virginia slave code. She worked in the mansion and came with the Washingtons to New York with seven other slaves and then to Philadelphia with nine others. Pennsylvania’s gradual emancipation law applied to Philadelphia. It exempted congressmen but not members of the executive or judiciary. Washington privately insisted the law did not apply to him, as he came to Pennsylvania only because the government located itself there. Instead, as a non-resident, Virginia’s law should apply to him. Non-residents could keep slaves in Pennsylvania for up to six months without losing them. Like many other slaveholders in the government, Washington circumvented the law by rotating slaves in and out of Pennsylvania regularly and also took pains to ensure he never stayed for more than six months and so never potentially took up Pennsylvania residency. The first six month deadline fell while Washington traveled the South, but Martha took Ona and one other slave to Trenton, New Jersey for two days to evade the law’s reach. She dispatched the rest of the household slaves back to Virginia. Judge’s friends hid her and then arranged for her passage on a ship to New Hampshire, taking her far from Washington’s reach. 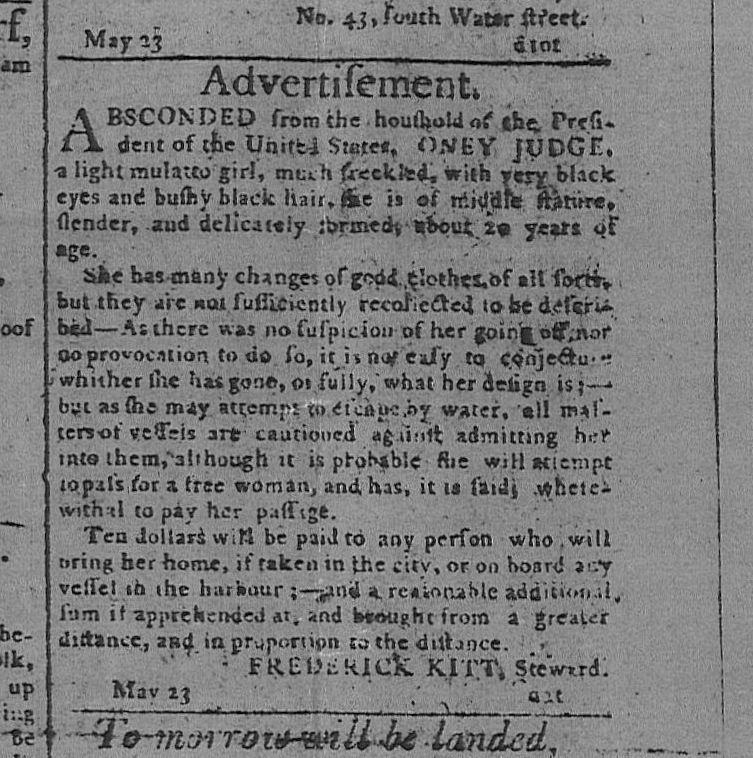 His agent put an advertisement seeking her into the Phliadelphia papers, but due to Philadelphia’s large antislavery population, mostly Quakers, Washington tread carefully. Ona freed herself in the sense that she no longer faced the daily reality of life as a slave, but life as a fugitive had its own perils.